We are seeking a cultural transformation to 'turn the tide' of inactivity by providing choice, motivation and support in a co-ordinated way to change the behaviour of inactive groups by engaging them in physical activity and sport. Watch videos that show some of the great work already going on across Derbyshire to inspire active lives. Georgia Saunders from Erewash Valley Gymnastics Club talks about the ways their club works with the community and how this has helped to increase participation. This is a great example of how the club is working towards building a more active Derbyshire. These inspirational young people are getting involved and changing lives with their volunteering. 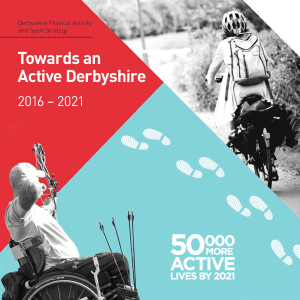 This all helps towards an active Derbyshire and our goal to get 50000 more active lives by 2021. Glossop parkrun, Buxton Athletics Club and Jog Derbyshire changing lives in Derbyshire and helping Derbyshire Sport to reach the goal of getting 50000 more active lives by 2021.